A compilation of audio artworks featuring animal sounds...a call went out to artists from around the world for submissions that creatively used recordings of animals sounds from the urban environment. 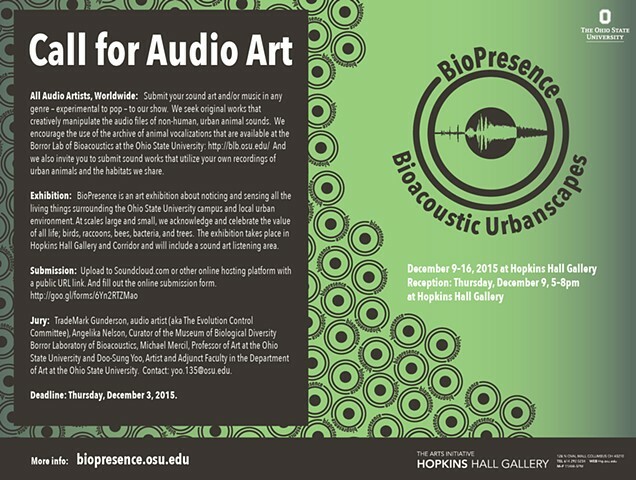 Artists had access to over 40,000 recordings from Ohio State’s own Borror Laboratory of Bioacoustics, another partner in the BioPresence project, as well as more recent recordings from wetlands near Ohio State’s campus taken this past spring and summer. The winning works were selected by members of the art department faculty and Angelika Nelson, the curator of the Museum of Biological Diversity at the Borror Lab, and presented in an upstairs classroom with an enveloping sound system. From experimental pieces to melodic songs, the creative array of audio works was impressive, and the compilation provided a fascinating addition to the visual works in the exhibition, although its out-of-the-way location prevented a wider audience from experiencing it.